Since its start in the fall of 2010, AMC’s The Walking Dead has been able to consistently top viewer charts all over the United States. TWD manages to rake in the coveted 18-49 age bracket in television viewer statistics better than pretty much any other cable television program, including primetime programming, professional sports events, and even the Olympics (still, it has yet to beat the Oscars). Thus, with such killer ratings, the show is pressured to keep being, well, killer. However, zombie brains splattering all across lower Georgia can’t, alone, keep the audience enthralled. I mean, we’ve got to have something backing our emotional character scenes and badass fight scenes. That’s where TWD steps in, with largely undiscovered musical talent. AMC has released two volumes of official TWD soundtrack which includes the stylings of Lee Dewyze, Baby Bee, Portugal. The Man, Of Monsters and Men, and TWD’s own Emily Kinney (who plays Beth Greene) among others. Both Volume One and Volume Two include soft folk tunes for the emotional scenes between characters, as well as the rock melodies that accented violent confrontations, whether between humans and Walkers, or humans and humans. However, the series boasts an impressive catalogue of songs and covers not included on the original soundtracks. Johnny Cash, Bob Dylan, Ted Nugent, Led Zeppelin, and Peter Gabriel hold up the classic end of the rock featured on the show, while artists like The Wailin’ Jennys, Ben Howard, Wye Oak, Sharon van Etten, and the Mountain Goats, hold up the underground end of the soundtracks. The two accent each other well, flowing seamlessly between composer Bear McCreary’s scores. In a world of apocalyptic ruin, it seems strange that such a heavy influence is placed on the music of the series, since the survivors themselves haven’t heard any music (save Beth’s occasional somber crooning) in years. However, with rating in the tens of millions, TWD could prove to be a serious platform for artists to break into the mainstream music world. Upon browsing Spotify, the artists who are lesser known have their highest ratings and listener counts on the songs that were used on TWD at some point. 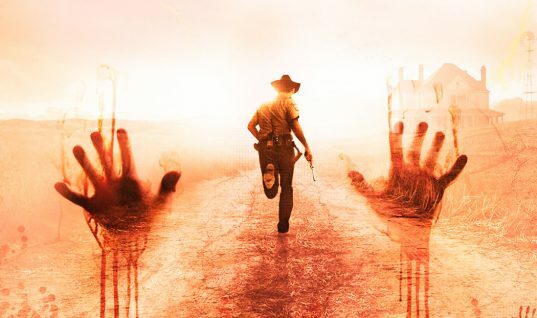 For artists whose work is used on the show, the Walkers just might be, rather than the end of the world, the start of a new one.